This condition is an irritation of the cartilage on the back of the patella (the kneecap) that causes pain in one or both knees. 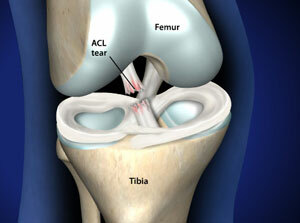 These conditions include anterior knee pain syndrome, patellofemoral malalignment, and chondromalacia patella. 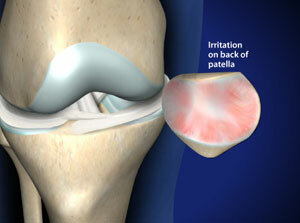 Patellofemoral pain may be the result of irritation of the soft tissues around the front of the knee. Strained tendons are fairly common in athletes. Other contributing factors to patellofemoral pain include overuse, muscle imbalance and inadequate stretching. Pain that begins in another part of the body, such as the back or hip, may cause pain in the knee (referred pain). In some people with runner’s knee, the kneecap is out of alignment. If so, vigorous activities can cause excessive stress and wear on the cartilage of the kneecap. This can lead to softening and breakdown of the cartilage on the patella (chondromalacia patella) and cause pain in the underlying bone and irritation of the joint lining. 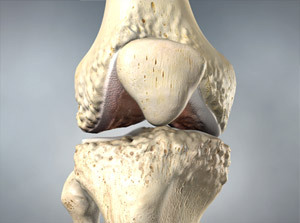 A dull, aching pain under or around the front of the kneecap (patella) where it connects with the lower end of the thighbone (femur). Pain occurs when walking up or down stairs, kneeling, squatting, and sitting with a bent knee for a long period of time.